2018 AWARD BEST PERMANENT MAKE UP CLINIC. 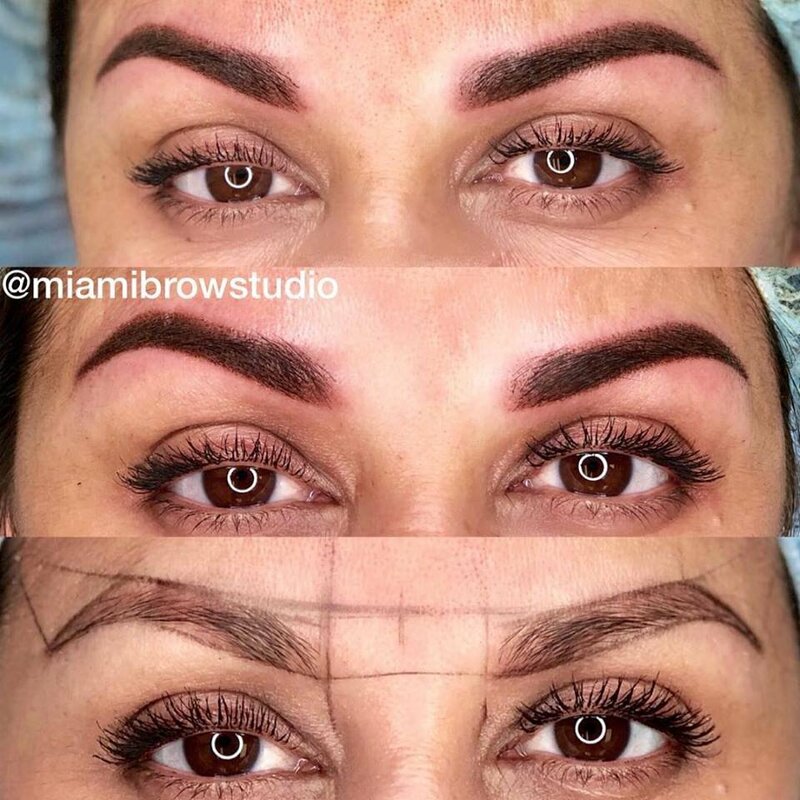 With over 7 years professional medical aesthetic and permanent makeup experience, Miami Brow Studio Academy is the premier Microblading & Shading training in the state of Florida. Mariana Ruiz is a leader in permanent make up cosmetics. Her quality of treatment and flair for innovation is unrivalled in the profession and she travels the world researching new techniques and best practice to ensure that her clients leave her clinic with a perfect result. As seen on Voyage Mia: Mariana Ruiz the local artist who inspire us. Ombre brows last longer than Microblading, and are a much better option for clients with high amounts of naturally occurring oils in the skin, dark skin or corrections of faded permanent makeup giving that perfect ombre makeup effect. $299 Microblading & Shading*touch up after 6 weeks not included. Microblading is the new treatment and most natural hair strokes. Microshading and some experts believe it’s better suited for those with oily and sensitive skin or thicker eyebrows that only require a bit of shaping. $399 Full lips- Defines the edges of the lips and to create a better contour and symmetry. $349 Permanent Eyeliner – Fills in between the lashes to create the illusion of thicker, darker, and completely full lashes without looking lined or like obvious make-up. 2Does it hurt? Will you numb me? 3Can I get them wet or work out? No, not for at least two weeks to keep the treated area dry and reduce the risk of complications or infection and to retain the maximum amount of pigment implanted. 4Will you draw in the shapes first? Yes, I won't start on you until you agree with the color selected and shape. 5How long is the appointment? About 2 hour with most of the time spent going over colors and drawing in shapes. 6How long does it take to heal? Will I be able to go to work? Healing period is four weeks. As long as you're good at following aftercare instructions, there shouldn't be a problem going to work or being out in public. 1It has been a week and my brows is itching. Ictching is totally normal. It is essential that during the first week after the treatment you do not pick, peel or rub your enhancement. 2It is not yet a month and I already see colour unevenness ? Please rest assured, this is expected in many cases and also the purpose of the re-touch visit that is included in the cost of the first treatment. 3Should I send in a photo of myself before booking an appointment? We would encourage this if you have already undertaken permanent beauty treatment before, just so we can see how the old tattoo has faded. 4Will microblading work well for me? If you have extremely oily skin, the microblading technique may NOT work well for you. The constant production of oil will cause the hairstrokes to heal with a diffused, softer look. Your end result will look more powdered instead of a crisp hair stroke appearance. Clients with darker skin (Indian, African American, Filipino, etc. ), Please know that the Hair Strokes WILL NOT appear as defined or as dark as lighter skin types due to the skin color already being naturally darker. 5Is the second appointment necessary? For microblading, at least two appointments are needed initially, at least 4-6 weeks apart. At the second treatment, we will assess the color retention and make adjustments as necessary. Everyone heals differently and at different rates. If your cosmetic tattoo does not heal perfectly the first time, do not worry! We can always go bolder and add more density at your next appointment. 6Can I wear makeup after? Not on the brows for at least two weeks but everywhere else is fine. When I first went to her I was a nervous wreck. She made me feel very comfortable, she talked me through the whole process... I walked in with no eyebrows and walked out stunning.. she brought the little bit of eyebrows I had to life... she’s amazing. I 'm so glade to finally have a opportunity to come and do this review. Over 2 years ago I was reseaching for Microblading classes . Microblading wasn't even as popular . I got my first training when the first started. I had the opportunity to learn from this amazing professional Mariana how to do my first steps on draw hair strokes. I wasn't a natural but over the process was one of the best teachers I had. Besides been a amazing human been she is patient and she knows the craft very well. Mariana she invests a lot of her time to provide and make the students life much easy and giving you the tools to understand and perform a amazing job if you take it serious and practice . I highly recommend MIAMI BROW STUDIO . They really care about what they are doing . Thank you so much for take my life to the next level ! I took Mariana class on February 2017. She is an amazing, experienced and great instructor. The class was great! The support that she game me through every procedure, every problem and every question was unbelievable, like 24hrs!!!!. I'm a perfectionist and starting microblading was very hard for me. I texted her everyday, asked 100 questions and she was patient with me through the whole process. If I have to take anymore classes again, she is my first one to go with. Don't hesitate, she is the best! I traveled from Atlanta to get microblading training with Mariana. It took me almost one year to make a decision because I needed to be sure I would be trained by the best. Miami Brow Studio is one of the only schools that offer a 3 day training courses and tech me all techniques for eyebrows and the owner has more than 7 years experience. I need to write this review because it has surpassed my expectations. The studio is cozy and she is friendly and professional all at the same time. DON’T Be Scared if Brows are Darker at First The tattooed area will appear slightly darker for a couple of weeks. Don’t worry, that’s part of the healing process”. Don't forget microblading is a semi permanent make up and your skin and face shape are the variables. "The dryer your skin, the sharper your brows heal. If your complexion is oily, the hair strokes will tend to blur more." The phrase "sisters, not twins" is often used to describe brows. That's because no one's face is perfectly symmetrical. At the end of the day, microblading enhances your appearance, but it isn't plastic surgery. DON'T Skip Your Follow-Up Appointment Microblading is a two step process. Clients should come back four to six weeks after the initial treatment to fill any gaps and make any necessary color adjustments. DON’T Rush the Healing Process Speaking of, don’t rush the healing process, which can take four to six weeks. Some post-procedure swelling and redness may occur, but this usually goes away within 48 hours. As your brows heal, you may experience some dryness or minor scabbing. Don't pick, scratch or scrub. This can cause scarring and mess with pigment. To ensure your brows look their best by your big day, we suggests booking an appointment 12-16 WEEKS before your wedding day.